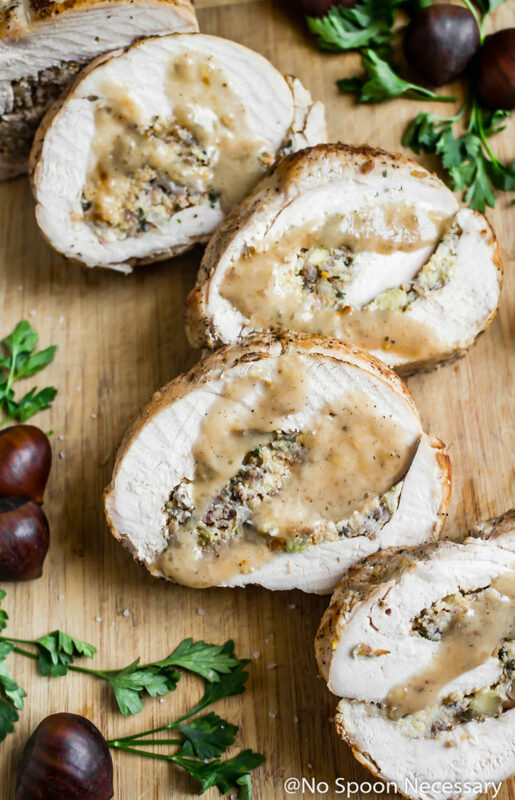 This Thanksgiving Turkey Breast Roulade is a total showstopper! Golden brown, roasted turkey breast is rolled up around a sweet and savory chestnut and sausage cornbread filling and drizzled with a silky flavorful gravy. Gorgeous and delicious, this Roulade is the perfect main for the holidays! Sound the alarm and gather the troops, because it is time for the center piece of your Thanksgiving table. The piece de resistance. The holy grail of turkey day. The actual turkey! Yay! Oh, ohhh. And the gravy! Double Yay-Yay!! I do still have more Thanksgiving NSN recipes for you, but I wanted to kind of skip forward to the main dish, because I know most of you preorder your turkey. Or, you plan your entire meal around the gobble, gobble platter of yum. So, I thought I would be oh so nice and share my go-to turkey recipe now, so you have plenty of time to prepare. Juicy, tender turkey breast rolled up tight around sweet, savory, earthy and rich stuffing. 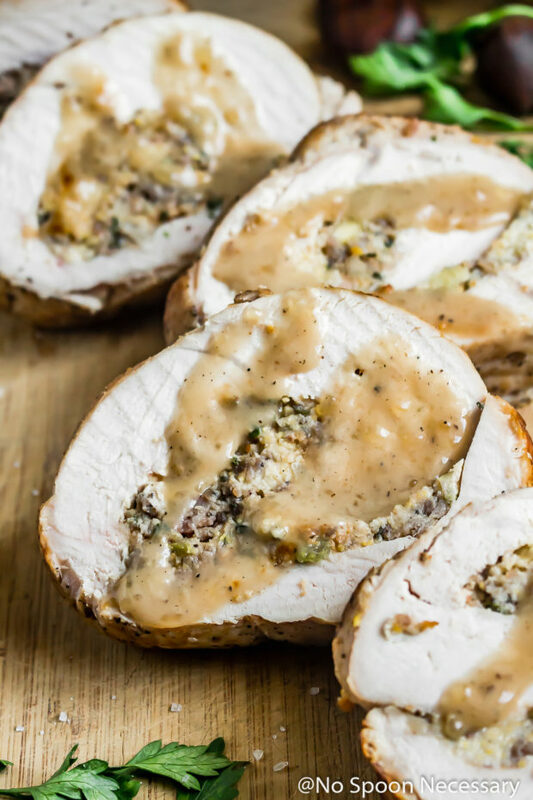 This holiday turkey breast roulade is gorgeously golden brown on the outside and mouthwateringly juicy on the inside with flavorful, moist, perfectly cooked swirls of stuffing. Generously drizzled with a silky, smooth, rich gravy, this turkey situation is like two-in-one holiday gift from the culinary Gods! I mean, this roulade is basically the two very best parts of Thanksgiving, literally all rolled into one! This stuffing filled turkey roulade is elegant and refined. Not to mention, healthier for you. 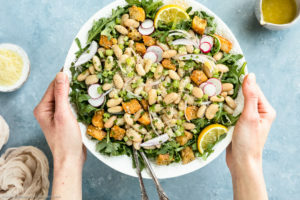 Which is perfect, because now you don’t have to feel so guilty when you want to indulge in more sides and dessert. Score! 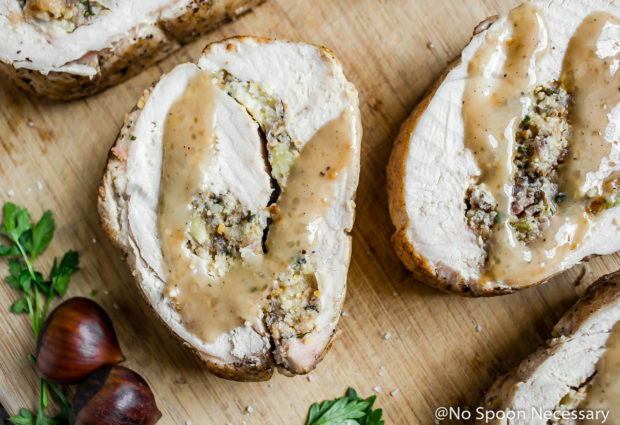 And, in case that didn’t sell you, this stuffing filled Thanksgiving turkey breast roulade is also a lot more time efficient, as it can be prepared in advance AND only takes less than 2 hours to roast! Can I get a high five?! *If having crispy turkey skin is a non-negotiable holiday tradition, I have included that option in the notes section of the recipe below! What is a turkey roulade? A turkey roulade is a dish made up of rolled turkey and a filling. 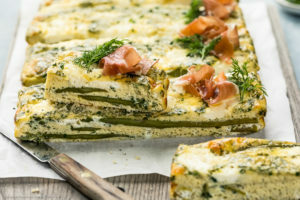 The filling, or inside rolled layer, can be anything from stuffing as seen here, to thinly shaved meats (like proscuitto), vegetables and grated cheese. A roulade is traditionally found in various European cuisines, and the term orginates from the French word ‘rouler’, which means ‘to roll’. To serve, roulades are sliced into rounds to reveal the gorgeous filling. What to serve with a turkey roulade? What to serve with a turkey roulade will greatly depend on the filling and preparation of the roulade. 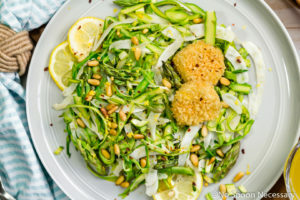 However, you can serve any type of side with a roulade – from salads to carbohydrates. 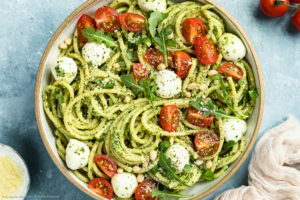 If you were making an Italian roulade, or involtini, tomato sauce and pasta is a great choice. Since this Thanksgiving roulade is already filled with stuffing, I would steer clear of more stuffing and opt to serve it with any other type of traditional (or non-traditional!) holiday side. Think: potatoes, rolls, casseroles, vegetables, etc. How to roll a turkey roulade? While a roulade does look impressive, it really is quite easy to roll together! I put together a step-by-step How To Roll a Thanksgiving Turkey Breast Roulade photo collage below for you to reference. Make sure you butterfly the turkey breast and use a mallet to gently pound the turkey breast to an even (3/4-inch) thickness. When stuffing the turkey roulade, make sure to leave a 1-inch border on all sides and make sure to not mound the stuffing or the turkey will be very difficult to roll. If you have any leftover stuffing, place it in a buttered baking dish and bake it alongside the turkey during the last 45 minutes-1 hour of roasting. Make sure you roll the turkey starting at one end, jelly roll style. Be sure to tie the rolled turkey roulade firmly with kitchen twine every 2 inches to form a compact cylinder. Make this your year to shine and be the hostess (or host) with the mostess! 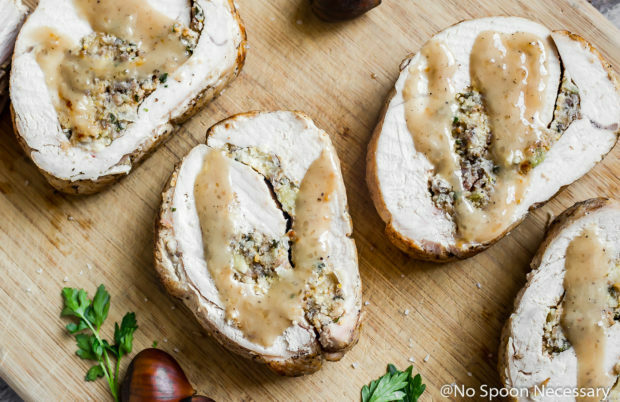 Think outside the traditional box and add this Thanksgiving Turkey Breast Roulade to your holiday menu! Until next time, friends, cheers – to looking like a culinary rock star with an easy, yet elegant main that is guaranteed to please! 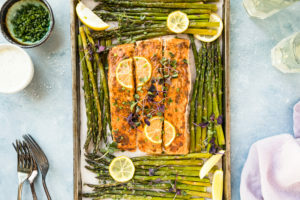 Preheat oven to 325 degrees F. Place a baking rack on a sheet pan or into a roasting pan. Lay the butterflied turkey breast between two large pieces of plastic wrap on clean work surface. Use a mallet (or rolling pin) to slightly pound turkey breast to an even ¾’’ thickness. Remove plastic wrap and discard. Sprinkle turkey with salt and pepper. Spread the stuffing mixture, in a ½’’ thick layer, evenly over the turkey leaving a ¾-1’’ boarder on all sides. Be careful not to overstuff the turkey or you will have a difficult time rolling it up. Transfer any remaining stuffing to a buttered baking dish and follow baking instructions below, adding it to the oven alongside of the turkey in the last hour of cooking. Starting at the shortest end of the turkey breast, skin removed side down, roll the turkey up and over the stuffing, jellyroll style. 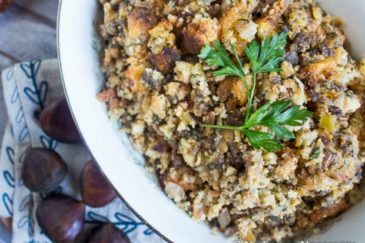 Use your fingers to tuck in any stuffing that escapes on the sides as you roll. Firmly tie up the turkey roulade with kitchen twine every 2’’ to form a compact cylinder. Heat oil in a large skillet, Dutch oven, or roasting pan (something large enough to hold the roulade) over medium high heat. Once hot, add turkey seam side down to pan. Sear roulade on all sides until golden brown, about 5-6 minutes total. Check the side you are searing every minute, depending on how hot your pan is. You want to brown it on all sides, not burn it. Transfer the turkey roulade, seam side down, to the rack insert. **Keep the pan you seared the turkey in, you will use the brown bits stuck to the bottom to make your gravy**. Roast for about 1 hour to 1 hour 30 minutes, until a thermometer inserted into the center reads 160 degrees (be sure to test internal temperature in a few places. My turkey roulade took 1 hour, 25 minutes to reach 160 degrees F). Remove the turkey from the oven and tent with aluminum foil. Allow the turkey to rest at room temperature for 15 minutes before carving into ½- ¾’’ thick slices. While Turkey is roasting, prepare the gravy: Make a sachet by laying a large piece of cheese cloth on a clean work surface. 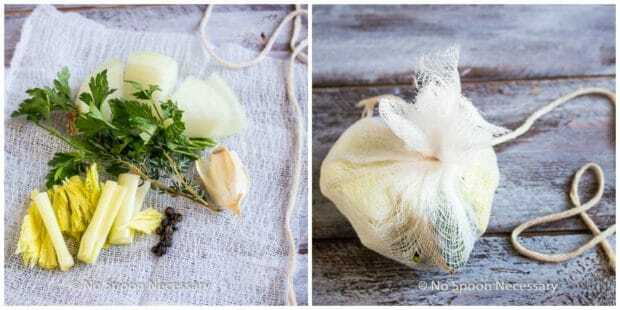 Place all sachet ingredients in the middle of the cloth, bring up the sides and tie the top with kitchen twine to form a small bag. (See picture included in blog above). Add chicken stock and sachet to a small saucepan and bring to a simmer over medium-low heat. Cook until stock is reduced to 2 cups, about 25-30 minutes. Set aside. Place the pan you seared your turkey in over medium heat, add wine and vinegar. Cook until reduced by ½, scraping up brown bits left in the pan. Add the reduced stock and bring to a simmer. In a small mixing bowl combine potato starch with 2 tablespoons + 2 teaspoons of water to form a slurry. Whisk slurry mixture into stock. Continue simmering the gravy, stirring constantly, for 2-3 minutes, or until mixture has thickened to desired consistency. Season generously with salt and pepper, to taste. Turn heat down to low and stir in heavy cream. Keep gravy covered, over low heat and stir occasionally until ready to use. When ready to serve, remove the gravy from the heat and strain through a fine-mesh sieve. Taste and adjust for seasoning with salt and pepper. Serve Roulade with gravy and extra stuffing on the side. *Turkey Breast can be skinless or with skin still on depending on your preference. If you want the traditional crispy skin on the outside of your roulade carefully remove the skin before starting with step 1 and set it aside. Continue as instructed stuffing and rolling the roulade. BEFORE trussing the roulade take the turkey skin and wrap it around the roulade, encasing it. Then proceed with trussing the turkey roulade. 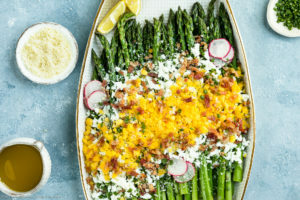 * To Use Extra Stuffing as a Side Dish: Butter a baking dish or shallow gratin dish. Transfer extra stuffing to prepared baking dish and cover with aluminum foil. Bake alongside turkey for 40 minutes. Uncover, brush with 1 tablespoon of melted butter and continue to bake until top is golden brown, about an additional 30-40 minutes. -The turkey roulade can be prepared in advance through step 4. Simply wrap the roulade in plastic wrap and store it in the refrigerator overnight. Before brushing with butter, browning and roasting, allow the roulade to sit on the counter, at room temperature, for 30 minutes. Did I miss it, or is there no gravy recipe for this amazing sounding recipe? If there is none, can you tell me where I can find it? You must have overlooked the gravy. It is included in the recipe – please see step number 9… It’s in bold. Cheers! A roaring success! I just made this today for some friends since I was making a Thanksgiving dinner (late) in Italy, where a whole bird is hard to find, and storing it in smaller fridges and roasting it in even smaller ovens are near impossible. It came out of the oven and my friends were blown away, and they ate almost the whole thing! I will definitely remember this recipe and roulade tutorial for another time. But again, overall it was a huge hit and delicious! I’m so glad it was a roaring success! Unfortunately, turkey breast can come out a bit dry if you overcook it (always remember to temp your turkey breast because no two ovens are alike – different ovens run at different temperatures). I normally dry brine my turkey breasts first. If yours came out dry, I would highly suggest doing that in the future as it’s super quick and easy to do! As for the strings, they should be very easy to snip off using kitchen shears, and then you just gently pull the twine off the turkey. Let me know if you have any additional questions or need more clarification on anything!! I am always here to help! This was a great recipe. We may make this every Thanksgiving from now on. Hi. This recipe sounds wonderful and we’re going to make it for Thanksgiving. Do we use one long piece of kitchen twine or individual, shorter pieces to make the knots. Thanks and Happy Thanksgiving! I used individual pieces of twine. If you go back through the post, you will see I have photos of rolling the roulade and tying it for visual aid! Let me know if you have any other questions! Cheers and Happy Thanksgiving! I am planning on feeding 7 adults, one child. Would you recommend making 2 roulades? I’m always here to help, so do feel free to ask more questions should you have them! Cheers! Okay, this is a winner and I am officially a fan of making a roulade! This turned out perfect. Moist turkey breast with delicious stuffing in every bite. For a holiday or special meal it is really a pretty dish too. Once you slice it and see the spiral inside… it’s a wow kind of dish. 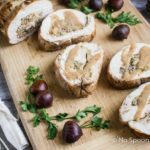 We really enjoyed this Turkey and Stuffing Roulade and I will definitely be making this for my guests at Christmas. Yay! If you want to see a picture of it I’m up on Instagram and put the hashtag of #nospoonnecessary and #ChefCheyanne to give you props for the recipe and technique. My husband really loved dinner tonight! 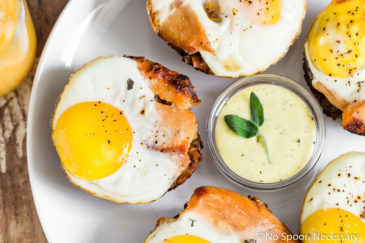 Making this today. I have a 4 person Christmas dinner this year and the thought of a whole turkey for just the 4 of us was too much food. This should fit the bill perfectly. As I’ve never done a roulade before I am trying it out now for just me and my better half. I found it easier than I thought to roll it up. I just thought of it as a sushi roll and used a gallon sized ziplock I split so it was a flat sheet of heavy duty plastic as a rolling guide. It rolled right up nice and tight. I also used your tip of wrapping it with it’s skin so we still have that yummy crispy skin with it. I loved your process and your description of how to do this and it truly worked well. I admire anyone who’s gone through culinary school and as a new reader to your blog, kudos to you! I’ll add to my comment and add a rating after it’s done cooking later tonight – before we fall into a turkey coma. 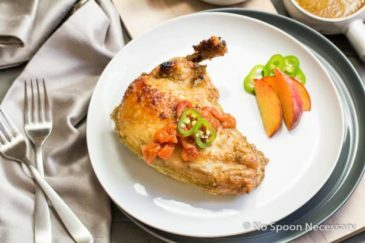 Just wanted to say hi and thanks for the recipe! This sounds wonderful, and I plan to try it this Thanksgiving. I purchased 2 seasoned butterball turkey breasts, one is savory herb and one cajun, because I have family members who like things spicy! : ) I do have a couple questions though….I generally brine my turkey. Do you think that’s necessary? Also, since turkey breasts can be dry, I was wondering about using a roasting bag to bake them. 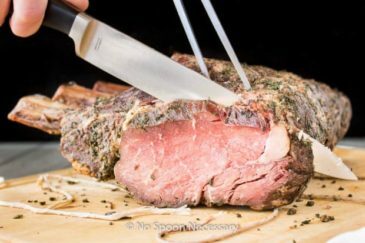 Have you ever used a roasting bag for the roulade? Thanks in advance for your response! I’m a fan of spicy things as well, so using a Cajun turkey breast sounds wonderful! You can absolutely brine your turkey breasts and use a roasting bag if you would like! Both of those things will simply ensure a more juicy, moist turkey, so go for it! 🙂 Let me know if you have any other questions! Thank you so much for stopping by! I hope you have a beautiful Thanksgiving! Sorry I’m clearly not seeing it- but could you send me the link to the stuffing recipe? Please let me know if you have any other questions, Kate!! Cheers and thank you so much for stopping by!